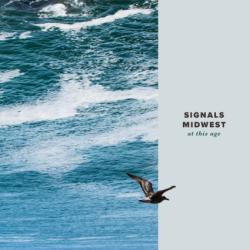 Cleveland indie/emo act Signals Midwest release their fourth album At This Age via Tiny Engines on 2nd September. Recorded at Atlas Studios in Chicago, IL in September of 2015, the album was produced by Into It. Over It.’s Evan Weiss. It’s an album of coming of age. Not your typical American ‘coming of age’ movie style, but getting older, dealing with change and becoming a proper adult. As the band say, “I was asking myself questions like ‘How do I evolve as a person but retain what I love? How do I advance through the world but sustain the things that excited me when I was first discovering them?’”. This guides the album through various angles of self-doubt, confirmation, acceptance and growing up. Relatable emo for people in their late twenties / thirties. An album for people that have realised that you can’t always be young and carefree, an album for people that have accepted that and can appreciate their lives and how they’ve changed. As such At This Age not only sounds like a cathartic album for the band, but also acts as the sound track for this particular reviewer. Lyrically Signals Midwest have it right on the money here, but it is in the music and composition of each track that they really excel. While it’s a relatively short album (10 tracks coming in just over 30 minutes) each track feels like the perfect length – each note of measured and assured emo comes together wonderfully feeling natural and perfectly formed. There’s not a weak track here, every track comes in on note and you can’t help but fall in love with the album. In many ways it’s your archetypical emo album, there’s nothing ground-breaking or out of the normal about the album, rather it’s the sense of genuine honesty and integrity to each track that suckers you in and makes you listen to the album on repeat. It’s one of those albums that even after the first notes of opening track ‘You’re Going To Be Golden’ you know that will surely become one of your favourites. Natural and a real pleasure to listen to, At This Age is by far Signals Midwest best work to date. Get in on it.